Bedford Clock Collection offers you the elegance and beauty of classic style with the modern reliable technology of today’s wall clocks. 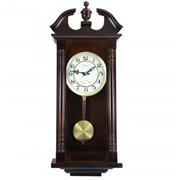 Whether a gift to your self or for someone else, this clock will add a special touch of sophistication to any room. With its stunning Cherry Oak finish, Golden Accents and Swinging Pendulum, this wall mountable time piece is not only an attractive focal point, but a functional and reliable piece of technology. With 4 distinct Chimes, the clock will announce the beginning of each new hour for your convenience. Carved details and special touches through out , as well as a convenient Sleep Mode that provides you with the option to pause the melodic chimes of this beautiful time piece for an entire 12 hour period with a simple push of your finger. * Wood and Metal Pendulum-8"